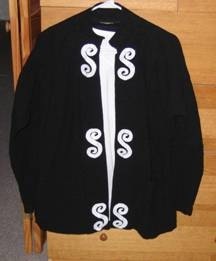 I’ve couched the copper braid around the first S.
My concern was not about the give and stretchiness of the fabric, but about the jacket itself. Could I hold it in my hand in a stable enough manner to be able to couch the copper braid? 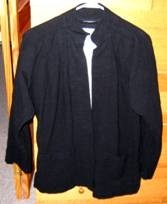 Could I deal with the underside of the border and the edge that is still attached to the collar? It was difficult. It took two hours. This is crazy! 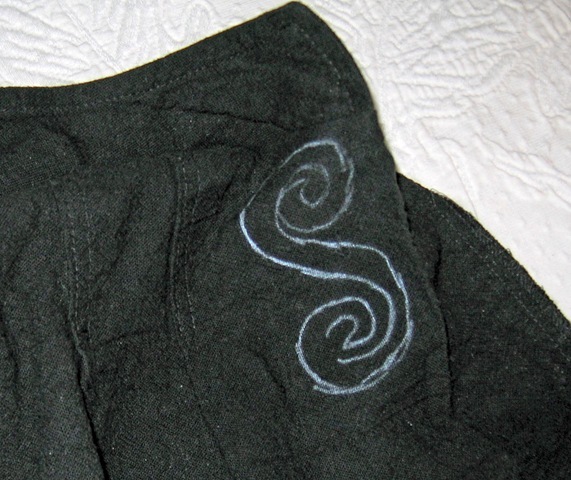 As you can see, I took some liberties with my white stitched outline to get the shape closer to what I wanted. 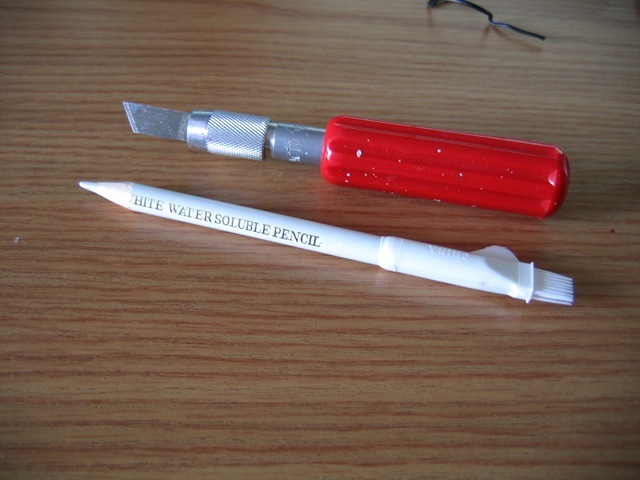 The remaining white pencil lines will either be stitched over or removed with water. And of course the white stitches will be removed. If I live long enough, I think I can do this. Having solved the design problems of the main design element by doodling on paper and on cloth, I’m now working on the technical problems of executing this design. The next step is getting the design transferred on to the fabric. The first problem is the fabric. My doodle cloth is a nice, fine, smooth, firm linen. 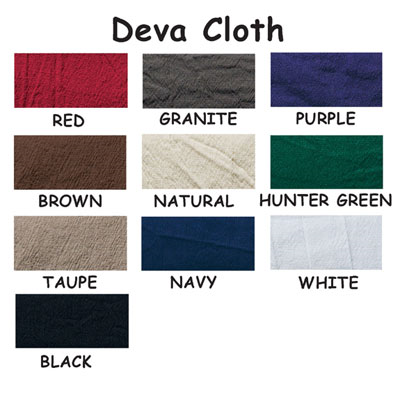 The jacket is made of Deva Cloth, described in the Deva catalog as “a sturdy, medium weight textured cotton loosely woven with a natural crinkle.” You may be able to see the texture of this fabric as it is shown in the catalog. It is not smooth and firm. It gives. It stretches. Second problem: the construction of the border. I don’t want the back of my embellishment to show. 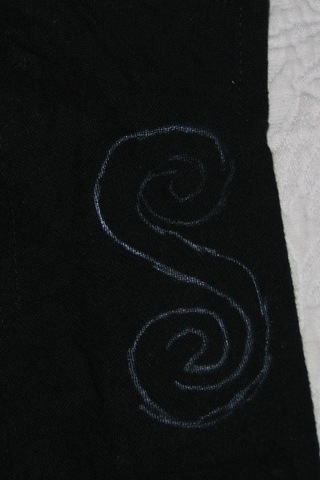 I want the inner part of the border to cover that stitching. To that end, I have deconstructed the borders, opened them up, so that I can put the design on the outside and stitch the outside only. My first attempt to transfer the design involved my light table. I tried to place the jacket over the drawing and trace it with a white pencil. 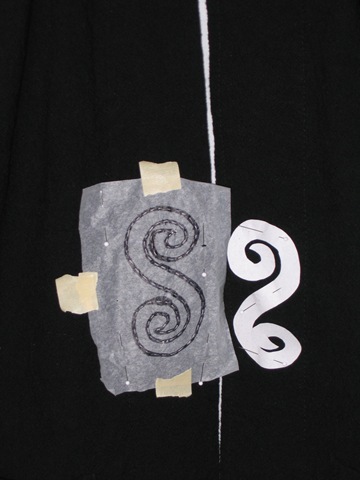 As you can see here, the top of the border is still partially connected to the collar, making a corner that I could not flatten enough to get a good tracing. Fortunately, I know several ways of transferring designs to fabric. The method I resorted to requires tracing the design on tissue paper with a marking pen, attaching the tissue paper to the fabric, then stitching a line of stitches through the ink line into the fabric. It is a tedious process, but it worked. Here you see one of my tissue paper tracings taped and pinned to the fabric with white stitches following the marked lines. This process had to be repeated five times. Then I carefully removed the tissue paper, in tiny fragments, leaving the white stitches on the jacket as my guidelines. In the process, I realized that the bottom Ss should not reach the hem, and so I repositioned them up an inch, which meant I had to reposition the middle Ss. 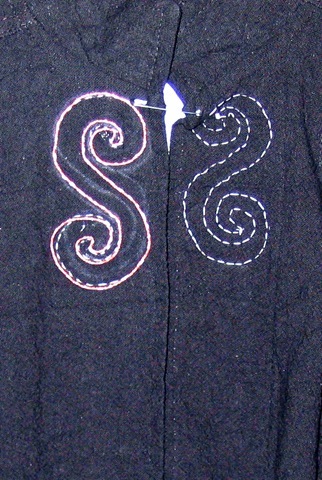 At last, the S shapes are on the jacket, ready for stitching. Getting this design transferred to the fabric has taken ten hours. 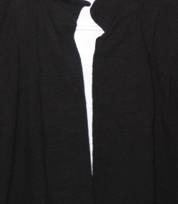 The next problem to solve is how it stitch the top Ss which are partly in the corner of the collar. I can’t hoop the fabric. 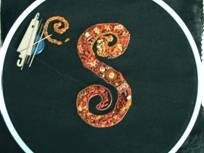 Will I be able to keep it stable enough to couch the copper braid over the outline? In 1996, after visiting my doctor and my lawyer (working on getting Social Security Disability Insurance), I stepped off a curb to get into our car and broke two bones in my left foot. 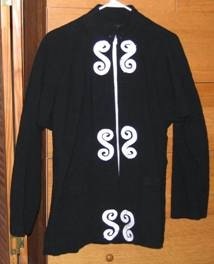 With my leg in a plaster cast up to my knee, already debilitated by ME-CFS, I searched my mind for something I could do and remembered a crewel embroidery kit I had begun working in 1979. When I became too busy with work and the arrival of grandchildren, I’d put the whole kit into a pillow case and stashed it away. Fortunately, I knew where it was. Although I no longer liked the design, I decided to finish it. 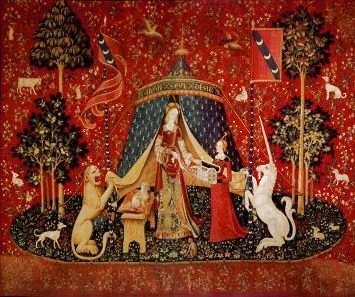 The design is based on the famous medieval tapestries known as The Lady and the Unicorn series, woven in “milles fleurs” style, popular in the 15th century, in which the background is filled in with “a thousand flowers.” Here’s one of the tapestries. Here’s the design I stitched. 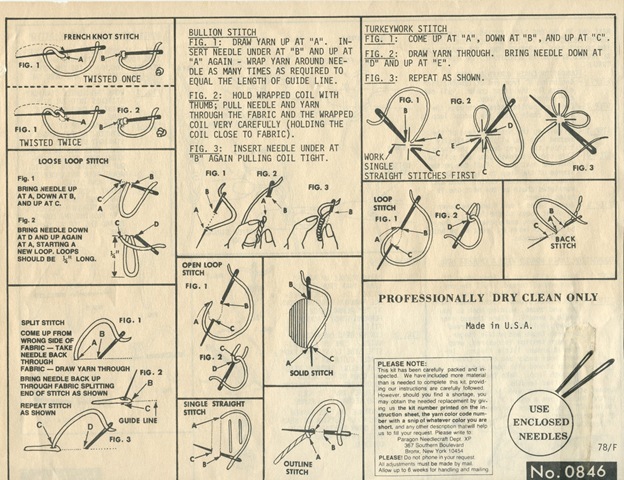 I even saved the stitch instructions from the kit, the only stitch instructions I had then. I still have them, yellowed with age. When I had finished it, I decided to give it to my seven-year-old granddaughter, thinking she might like the fantasy unicorn. That’s why I signed it “Gram” and framed it in a gilt frame. On December 26th, at my daughter-in-love Anne’s home, I saw this piece for the first time since 1996. It hangs over her bed. 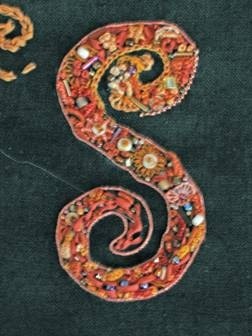 It was making this embroidery that got me seriously interested in doing more with needle and thread. 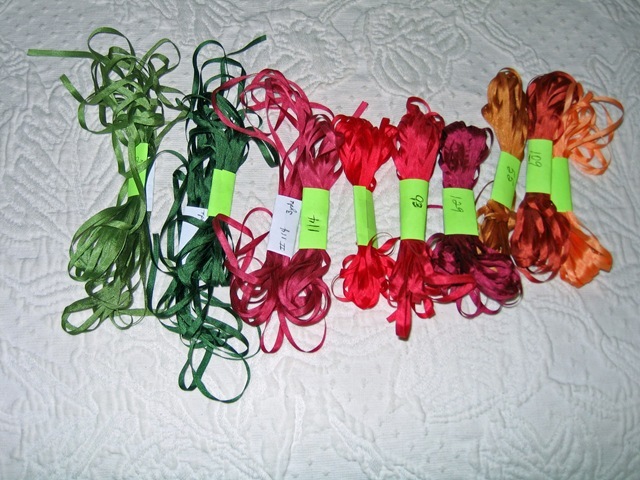 For quite a while I continued to work with crewel wool threads. It’s been a long time since I’ve done wool embroidery. 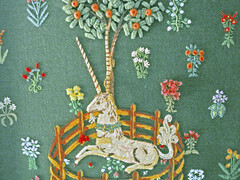 Soon after I’d finished the unicorn, I began working a crewelpoint design from a book, borrowed from the library. 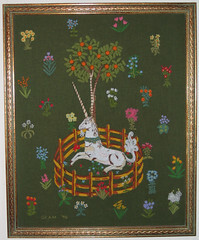 Crewelpoint is the combination of crewel stitches with needlepoint. With this project, I learned to work from a chart, rather than a design drawn on fabric, and I learned a few more stitches. It is also at Anne’s house. I’m touched that she has kept these beginner pieces of my work. Another view. This design represents row houses around a square with vegetable gardens behind the houses and a flower garden surrounded by a hedge in the center. A close-up of the center detail. 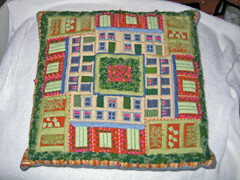 Lots and lots of French knots, around the center garden and bordering all the backyards. 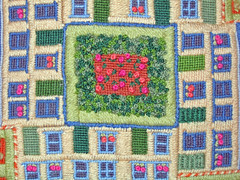 Self-taught from kits initially, then from books, for several years I worked variations on other people’s designs, trying many different techniques—cross stitch, needlepoint, traditional crewel embroidery, and other kinds of surface stitching. I became hooked on stitching. It became my new vocation. But what about now? Last year I became so active, continually experimenting with different activities, trying to pacify my hyperactive body, that I produced very little needlework. I became involved in some activities that I can’t just abandon. There doesn’t seem to be enough time for the stitching I want to do. I’m hoping this is a phase I will outgrow. 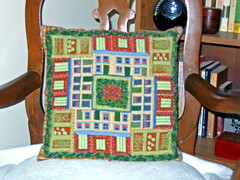 I hope I can go back to making things with needle and thread as a major, serious part of my life. 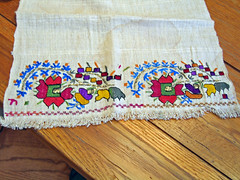 My daughter-in-law Karin showed me this towel or table runner that her mother had brought years ago from a visit to Turkey. Karin wanted to know whether anything could be done to restore the towel. 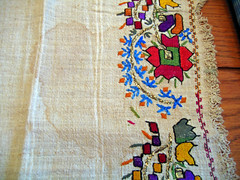 As you can see, it is badly stained and some of the gold stitches had been pulled to the front. 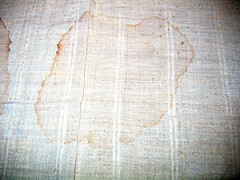 We have no idea what caused the staining. 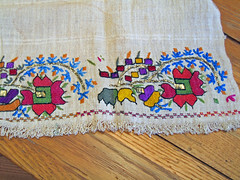 The fabric appears to be linen, and the stitching is very good work. I don’t know what kind of thread this is. It looked like cotton to me. 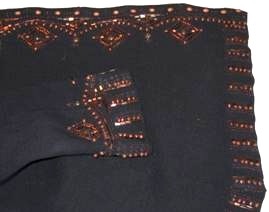 The goldwork, however, is stitched with flat metal strips. Although I managed to sink the loose ends to the back with a #20 crewel needle, it was very hard to get it through the fabric. I have no idea what effect water might have on it. In the picture below, especially if you enlarge it at Flickr, you can see the metal thread. Now, does anyone have any ideas about removing the stains from this lovely piece? Almost. Today I will pick up something I want to show the class, get the copies of my handouts, and check on the classroom setup. 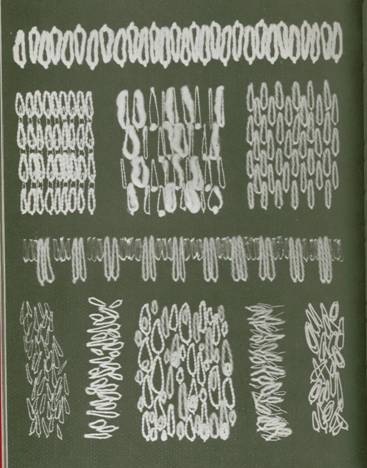 I’ll also be giving them copies of pages from Constance Howard’s Book of Stitches. 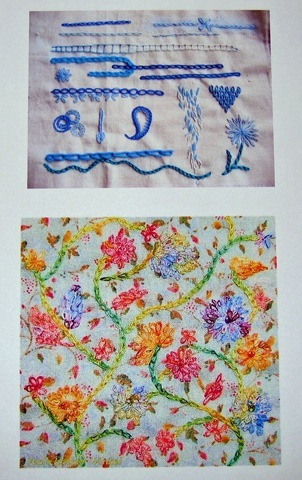 Below are photographs of work done entirely in chain stitch downloaded from the Internet, Flickr sites. These are also handouts for the class. I have made doodle cloths, two cloths for each stitch. I want to show them how I have played with the stitches. When I saw a resident carrying a bag made in India, covered with an embroidered design entirely worked in chain stitch, I asked her if I could borrow it to show my class. I’ll get it from her today. I will also be wearing a vest made in India, embellished with chain stitch that I further embellished with more chain stitch. I have phoned all of the eight people who have registered for this class, and I have spoken with or received messages in return from seven of them. Before I knew how many people had registered, I had already prepared eight kits. 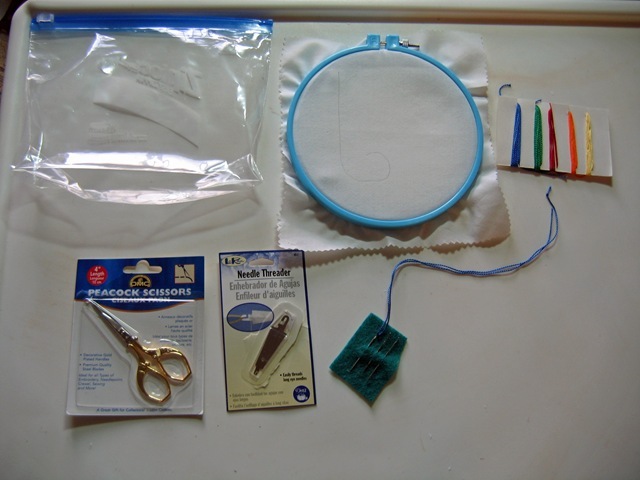 In a Ziploc bag, each participant will have a piece of cotton fabric in a 6” hoop; five colors of thread in pearl #5, pearl #8, and cotton floss; scissors; a needle threader; and three different sized needles, one already threaded with a knot in the thread. 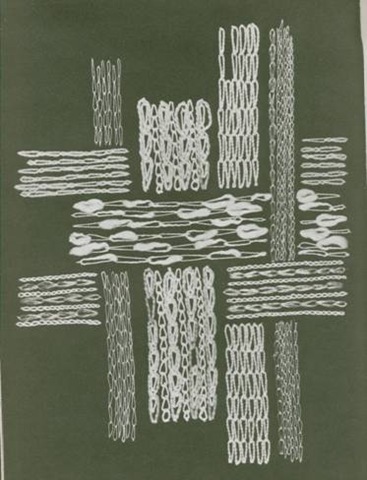 The first thing we will do is make some chain stitches. 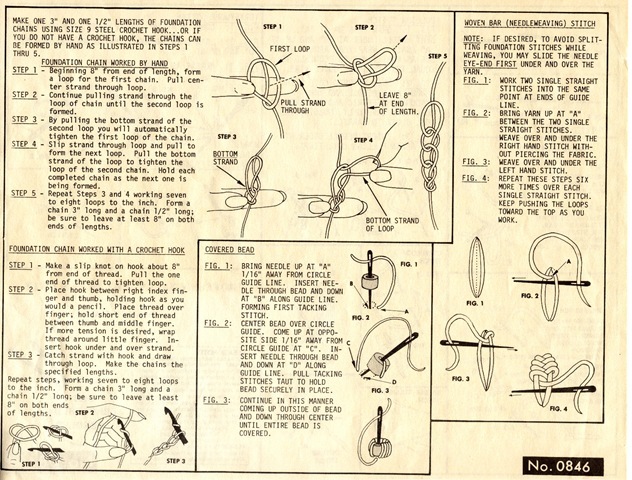 I plan to start with the detached chain stitch, making one “link” at a time. 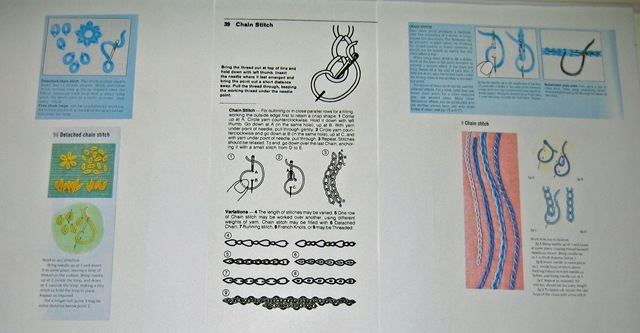 Then I’ll show how to make a line of chain stitches. On their hooped fabric, I’ve drawn in pencil a straight line that ends in a curve. Can you see that, faintly, in the photo? After we’ve made some stitches, we will talk about the chain stitch and about the idea of doodling. 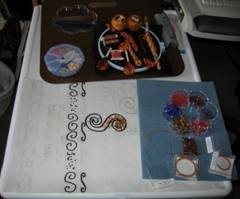 I will show my doodle cloths, and then I will encourage them to see what they can do, doodling with the chain stitch. That’s all we’re doing: doodling. The handouts are for them to take with them. I hope they will be inspired to continue doodling at home. My materials for all three meetings are prepared. I wonder how many of the registered people will show up. I wonder who, though not registered, may show up. 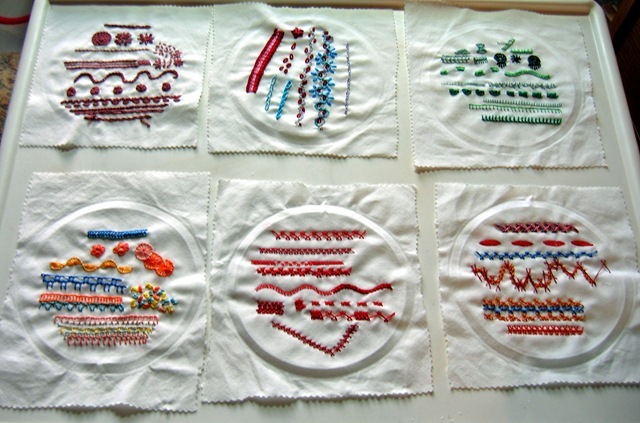 I wonder whether the participants will be able to doodle, to play with the chain stitch and see what happens. I wonder what I will see happen. 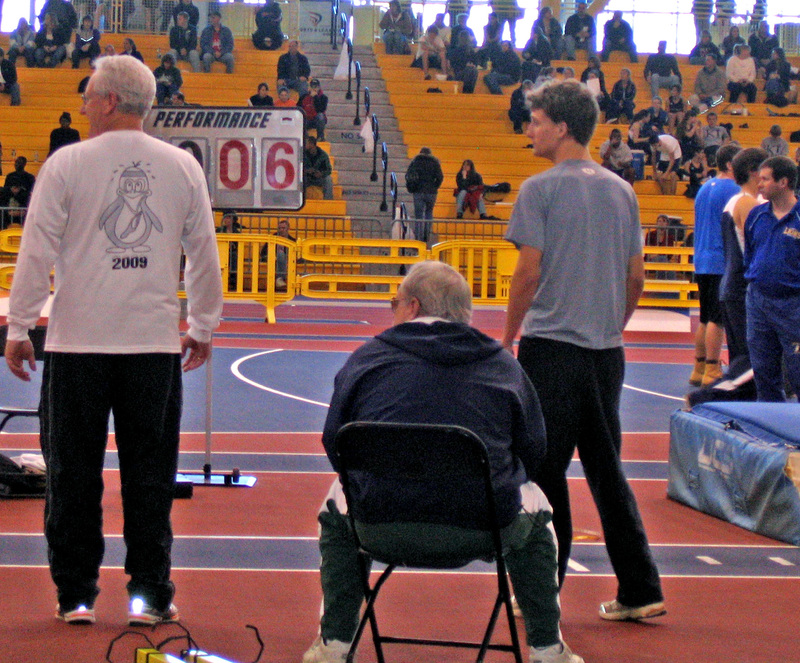 On Monday I went with my son Michael to a state-wide high school track and field tournament where my grandson Josh (who won the award for oratory in May) was competing in pole vaulting. 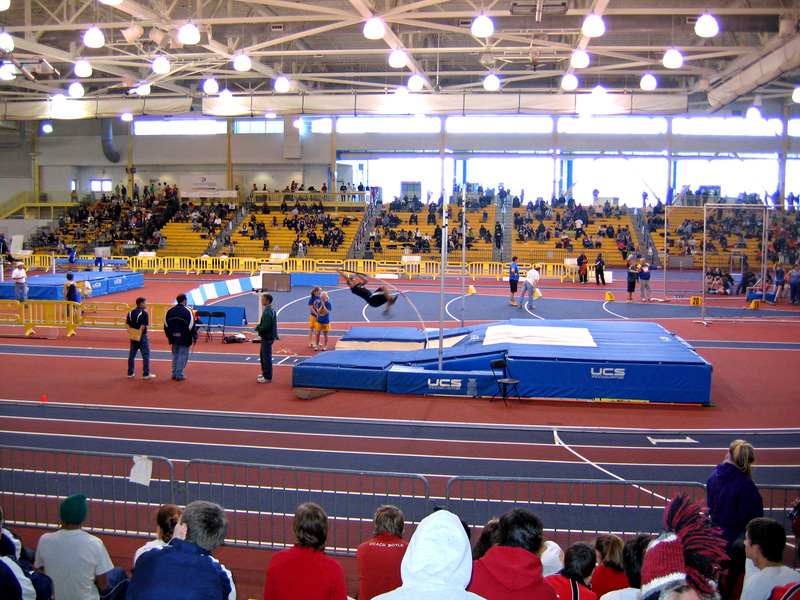 The meet was held in a large sports center where many events were taking place at the same time. 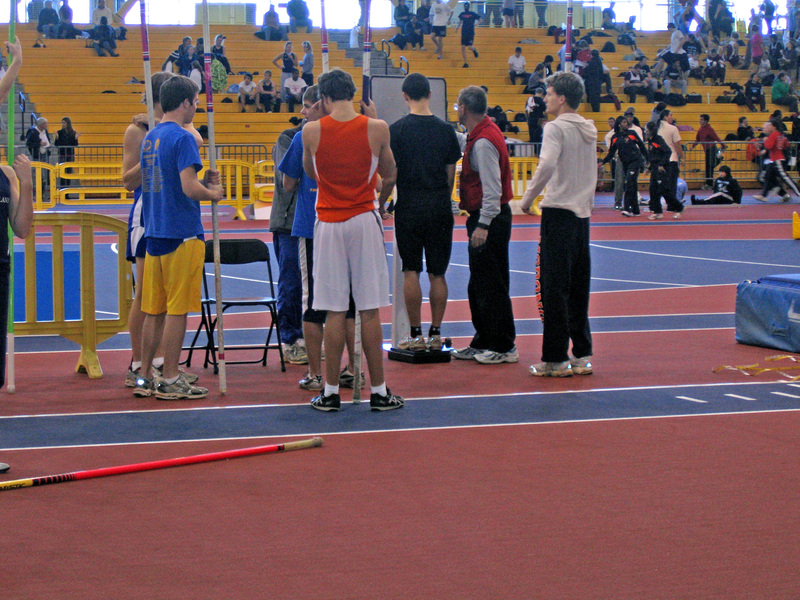 We waited for two hours before the pole vaulting began. It was my first time in decades being among a large crowd of teenagers. That was an enlightening experience in itself—seeing something of the culture in which my grandchildren live. Last year Josh won the state championship. On this Monday, he had awakened in a black mood. 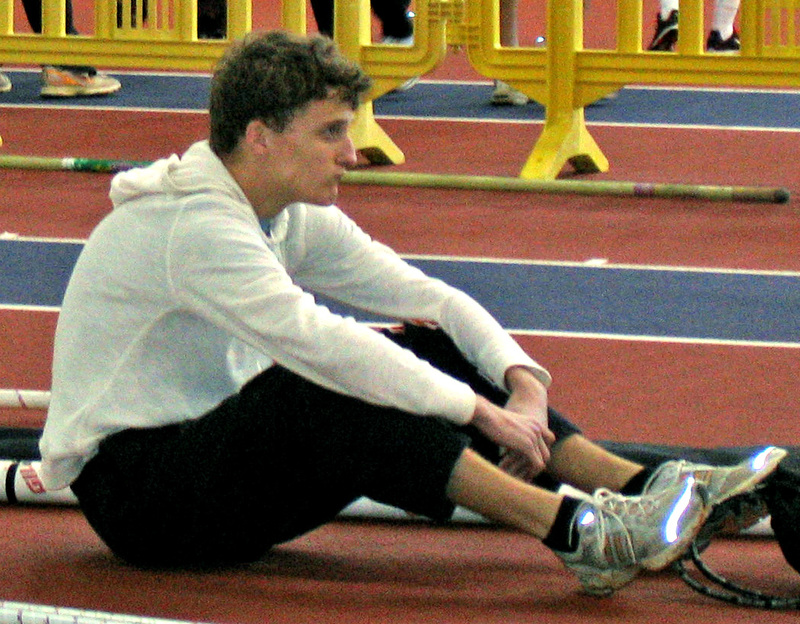 Having failed to clear the bar in his last three meets because he is unable to practice in the winter, not having access to an indoor facility, he was sure he would fail again. “I don’t want to do this,” he said to me in the kitchen as we were preparing to leave. For two hours Michael and I, with no access to Josh on the field, watched him, watched his despair manifested in his body language. Alternately, he paced along the track in front of the bar and sat, head down to his knees, hoodie pulled completely over his face, like a shroud. 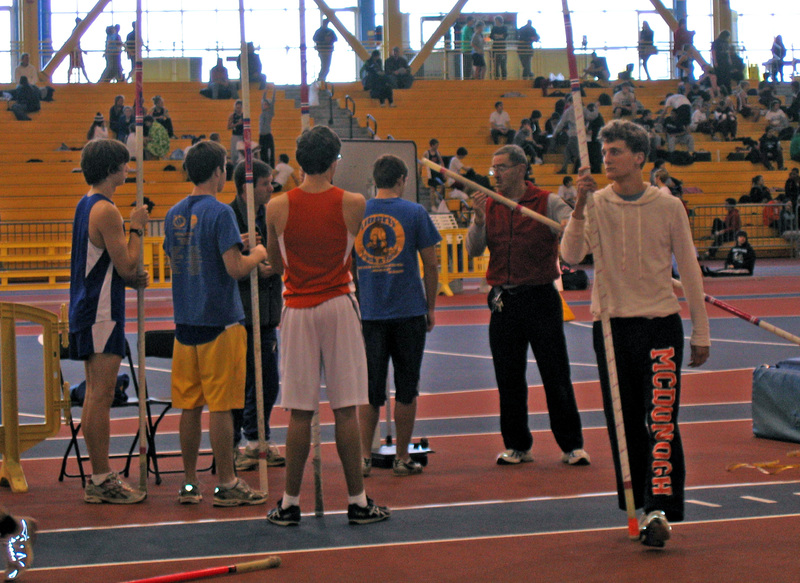 Josh had told Michael that if he failed to clear the bar, he would be ineligible for the state championships this season. It was grim. Michael was in anguish, knowing how badly Josh felt, and I was hurting for both my son and my grandson. In this video clip, the hoodie is gone, maybe that’s progress, but he’s still morosely pacing, not interacting with anyone. This is NOT Josh–usually buoyant, cheering on his teammates, and having fun. Finally, unable to stand it any longer, Michael spotted the McDonogh coach on the opposite side of the field. He walked around the perimeter and spoke to the coach, “Josh is in a bad place. Please go talk to him.” Which the coach did. Still, Josh remained grim, stoney-faced—no “Joshing” around. In the following clip, at least he’s talking to someone. Notice, though, how much fun the other kid is having, while Josh remains serious, impassive. On his first and second attempts to vault 10 feet high, Josh failed. 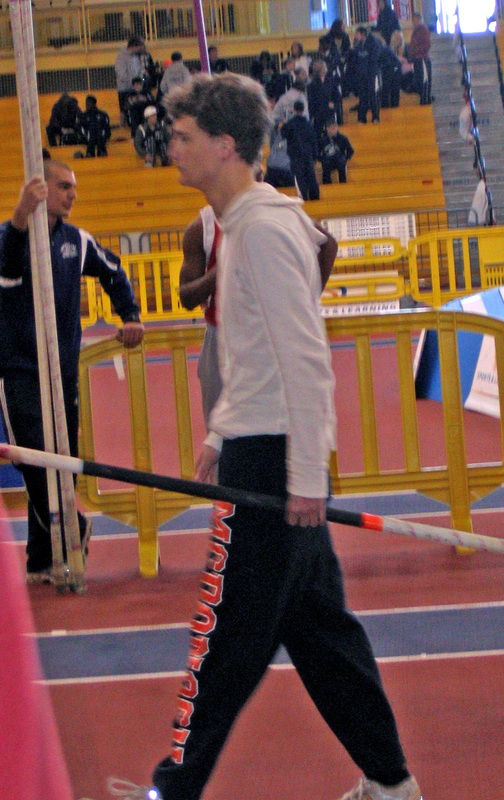 Now, Josh has vaulted 13 feet high. Ten feet is nothing for him. Imagine his despair. See the dejection and anger as he leaves the pit. But something happened to Josh between the second and third (last) attempt at 10 feet. He looked different. He rejected the pole he’d been using and chose another. In his demeanor I saw determination. “You can do it, Josh,” I was thinking as hard as I could. And he did! Stripped down to his McDonogh orange and black. Watch! After that, it was just practice for Josh. He kept vaulting as the bar was raised higher, but it was for the fun of it and for the practice. He had qualified for the championship meet. To Josh, that was what was most important. To me, what was most important was seeing the transformation in him. I saw him will himself out of a funk. Now that ability applies far beyond pole vaulting. Even though he still appears laconic here, now he is coaching his teammate. He is Josh again, actively involved, caring, and helping others.